Today we have published a new version of our web application. You will immediately notice the new images we are using. We are now having a large image for each lesson so that you get a better impression on what we teach in that lesson. We have also added smaller images on our retention section, indicating if there are words due for review. Since the timely repetition of new words is crucial for your language learning success, the Retention Section will now be on top of the Lessons Section if there are words due for review. With well over 100,000 words and phrases spread over 20 different languages, we know some errors do occur and so we have a special system to investigate and address them. Previously we need to manually enter your report but we have now integrated that system into our app. 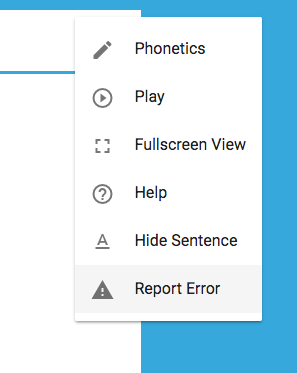 So in case you find an error (like a spelling mistake or a wrong translation), just hit the “Report Error” Button in the Menu of the Review and Quizzes and let us know what you think is wrong. We are periodically reviewing all submitted reports to ensure that our products are error-free. As usual please drop us a line if you have any questions or something not working as expected.